In our last installment, I related how my BTO Umax SuperMac S900 would stall for several minutes during startup before finally completing the boot process. Several readers kindly emailed suggestions, but nobody nailed the cause of the problem. However, at that point the machine would at least boot, albeit with the pause. When we first set up the SuperMac back in July, and again in late August, it manifested episodes in which it would refuse to recognize the hard drive, a Seagate Barracuda 2.15 GB, 7200 RPM unit purchased new as part of the BTO package from Other World Computing. In both instances, my Mac tech guru son, Tristan, performed some SCSI voodoo during weekends home and got the S900 working properly again. Indeed, it worked fine (save for the startup stall) all Fall until last week, when the dreaded flashing question mark once again began appearing. By happenstance, Tristan was home for a few days. He spent an evening alternatively stroking and goosing the SCSI bus until he thought he had it fixed again. Unhappily, the next morning, there was the question mark blinking at me. All along, the machine has been quite happy to boot from a CD, floppy disk, or a Zip disk, so our suspicions had been directed toward the hard drive itself. This time we tried installing the little 160 MB Quantum hard drive from my old LC 520. The S900 happily booted from that under System 7.5.5 with no problem. The night before this latest episode of boot reluctance, I had been checking out some beta software and had experienced a bunch of hard crashes, although the machine had restarted normally after each one and had been put to bed properly using the Shut Down command. However, now we could not get the Seagate drive to mount even with SCSI Probe. Whether we booted from the Zip drive or a CD, attempts to run Drive Setup resulted in the program crashing to a Code 4 error. Neither Disk First Aid nor Norton Utilities could see the drive, either. Finally, we stuck the drive into the LC 520 and established that the old machine would not recognize it. 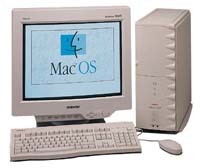 Of course, the old LC could not have booted Mac OS 9.0.4, but the drive did not respond enough to even tell us that (it did spin up) . "Time for a low level reformat of the drive," said Tristan. Most of the data on the drive was mirrored on my WallStreet PowerBook, but I had just done a large software download and hated to lose those files, so we decided to try mounting the drive with Tristan's Lombard PowerBook in faint hope of retrieving them. However, to our surprise, the drive mounted via a SCSI cable adapter without a hiccup, and we were able to save the unbacked-up files to the Lombard's hard drive. That accomplished, we initiated the low level reformat and decided to eliminate the partition that had been installed with the previous formatting. We installed OS 9. The Lombard booted up fine from the Seagate drive. The drive was reinstalled in the S900, and it seemed to work well there, too. Not only that, but the stall while booting was gone. I spent the rest of the evening transferring my files back onto the drive from the WallStreet via ethernet, reasonably confident that the problem was finally dealt with. No such luck. The next morning, when I tried to boot the S900, there was the flashing question mark again. Back into the guts of the S900, thankful that it is a relatively easy machine to open up and work on. Tristan pulled the Seagate drive for the umpteenth time, went to the Seagate website, and found the tech info page for this particular model drive. He deduced that the configuration jumpers had been factory set for PC and not Mac use, and altered the settings accordingly, as shown on the web page. That seemed to help somewhat, and when we reinstalled the drive in the Umax, the machine appeared to be working fine - that is, until the following morning, when it wouldn't mount the drive again. Tristan admitted that he was stumped - unusual for him. By a bit of trial and error, I discovered that I can get the Umax to boot by inserting a CD, waiting until the boot process commences, then hitting the reset button . At that point, the S900 will mount the Seagate drive, and I can eject the CD once the machine is booted. Once this initial startup has been achieved, the machine will restart as many times as you want from the system on the hard drive, or even shut down and restart so long as you do it immediately. Let it sit overnight, or indeed for an hour, and the problem returns. That's where things stand at this writing. It's not very satisfactory. The machine is usable, but starting it up is a major hassle. I suppose there would be the option of leaving it running 24/7, but my wife complains about the noise at night, even though the computer is 20 feet from the bedroom. I am inclined to suspect that the Barracuda drive is either defective or somehow incompatible with the S900, since every other drive we have tried boots it fine. I shall be contacting Seagate to get their spin on the issue. On a happier note with which to end this progress report, I have also installed a MacAlly PCI USB adapter card in one of the S900's PCI slots, and it works beautifully. I don't have a lot of USB peripherals, but an iMac keyboard (old type), a hockey puck mouse, and a Cirque Easy Cat trackpad now work nicely with the big Umax. Installing the adapter a simple matter of opening the S900's case (one thumbscrew and some elbow-grease), removing the blanking plate over an empty PCI slot aperture (one Phillips screw), inserting the MacAlly card in the slot, and replacing the securing screw and the case side cover. It was about a five-minute job start to finish. The instruction booklet for the MacAlly PCI to USB Card recommended trying Mac OS 9's own USB support first if you are using OS 9. However, there didn't appear to be any USB drivers included in my OS 9 installation. Some Apple website URLs are provided in the booklet, but they are outdated and produced 404 errors. The instructions specify Apple's USB Adapter Card Support version 1.3.5, which is also obsolete information, since the current version was 1.4.1, which is what I installed on the S900. You can find it the software download links by doing a search for "USB Adapter Card Support" on Apple's Web page. There are three options currently: version 1.4.1 of the software is recommended for Mac OS 9.x; it comes in International and North American English variants. Version 1.2 is recommended for Mac OS 8.5.1, and 8.6, which are the oldest OS versions that support USB. I downloaded version 1.4.1 North American English, a little over 700 k for the compressed file. Installation of the USB support software (a collection of system extensions) took a few seconds, and, after a restart, my iMac input peripherals worked nicely. However, if you plan on using a USB keyboard with one of these old machines, you may want to keep an ADB unit connected as well. Several functions, notably the power button and Command + Control + the power key for forced restarts, do not work with the USB keyboard (this is noted in Apple's support notes). The MacAlly PCI to USB Card sells for $69.00.